Leslie Salmon-Zhu of graphicrecorders.com is a well-known professional graphic recorder living in the San Francisco Bay Area. She has graphically recorded and collaborated in over 2500 meetings and conferences worldwide and is the founder of the International Forum of Visual Practitioners, an annual international industry conference and association. In meetings and conferences of all scales and industries, Leslie tracks and illuminates dialogue, decisions, plans and processes by creating mural-sized charts in real-time. Her services increase engagement and visual collaboration with the results being the surfacing of insights from the group. Leslie is known for her quick uptake of complex and unfamiliar content, feeling comfortable in contentious meetings and incredible speed and accuracy. Her work is perfectly weighted between accurate content capture and on-the-spot imagery that illuminates, not decorates, the group's ideas. 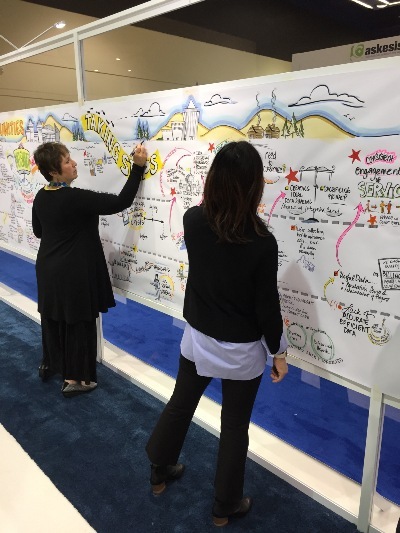 Following a meeting or event, Leslie's organized, content-detailing and artistic charts of the group's thinking are scanned to digital files, giving clients both a visual report and a launching point for future actions. In addition, the large original murals are also returned to the client to use for communicating the meeting results in other forms, such as displaying them in offices or sharing broadly with the meeting's stakeholders and beyond. Leslie's client list is rich with innovative companies and organizations from Fortune 100 corporations to the government, Silicon Valley technology companies, and small non-profits. Leslie's noticeable passion for her work stems from the drive to bring a larger "visual voice" to individuals' contributions so that organizations in which they work can be more authentically connected and successful.